Here are a few interesting facts about January thatll provide some clues to answers when solving. The carnation and snowdrop are the flower symbols of January. Capricorn (December 22 - January 19) and Aquarius (January 20 - February 18) are the zodiac signs for the month of January. Did you know that January is National Blood Donor month, National Soup Month, National Hobby Month, National Staying Healthy Month and National Braille Literacy Month? Welcome! Here you'll find the best riddles for the month of January. January is known for a lot of things, especially in relation to food. Did you know it's the baking month, fat free living month, hot tea month, oatmeal month & slow cooking month? The riddles you'll find here will reference many different things in relation to this month. Not only do we hand pick the best January riddles we find from across the web and social media, but we include our own original content you wont find anywhere else. Also here you will try and beat the clock! Timers are included on each riddle that stop once the answer is clicked. Your time is logged and compared to see how well you match up against other visitors. Have fun and good luck solving! 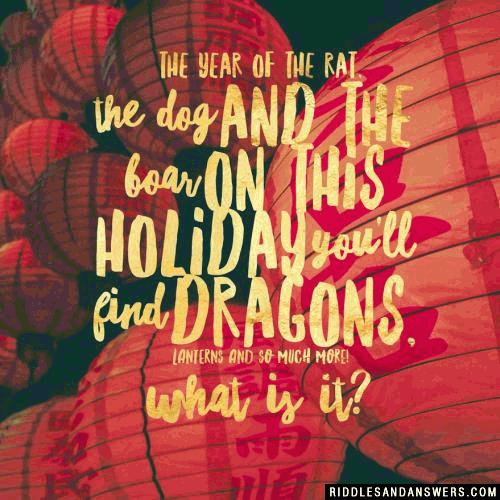 On this holiday you'll find dragons, lanterns, and so much more! But can you work out its name? There were 2 children, the son and the daughter. The daughter was born on January 20th and the son was born on March 12th. Both of them were born in the morning. Which one did their parents see first? The sun because it was the morning. On Mark's 21st birthday he rented a boat and rowed out into the middle of a lake. It had been a tradition that when his dad, grandfather, and great grandfather turned 21, they would walk across the lake to a cabin. But when Mark got out of the boat, he almost drowned. When Mark asked his mom why this had happened, what did she say? 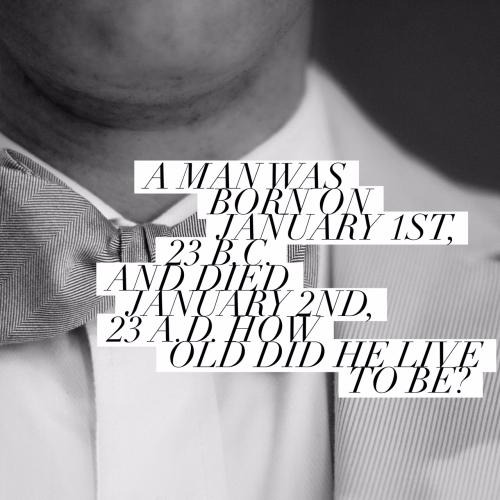 Mark's mom said, "Your father, grandfather, and great grandfather were all born in January. You were born in July." I asked a woman how old she was, she smiled and said cryptically: "The day before yesterday I was 22, but next year I'll be 25." What is her birthday and when was the date of our conversation? We conversed on January 1 and her birthday is on December 31.
Who established January 1 as the start of the New Year? Julius Caesar declared January 1 the start of the new year when he established the Julian Calendar. January was named for Janus, the two-faced god who looked both ahead to the new year and back to the previous year. 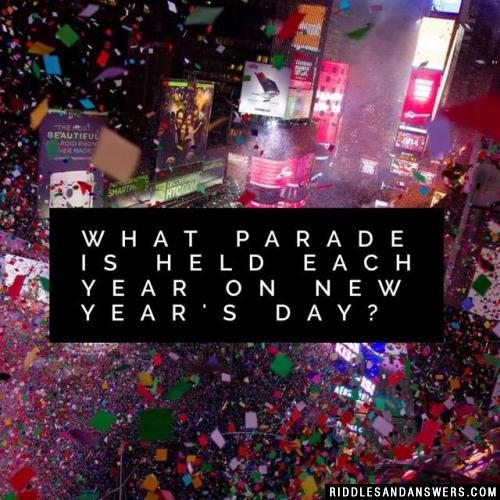 What parade is held each year on New Year's Day? The Tournament of Roses Parade, also known as the Rose Bowl Parade, occurs each New Year's Day in Pasadena, California. What is a phrase thats formed of 4 letters, but consists of 3, sometimes is written with 9, never with 5, and occasionally is made up of 12. Can you come up with a cool, funny or clever January Riddles of your own? Post it below (without the answer) to see if you can stump our users.